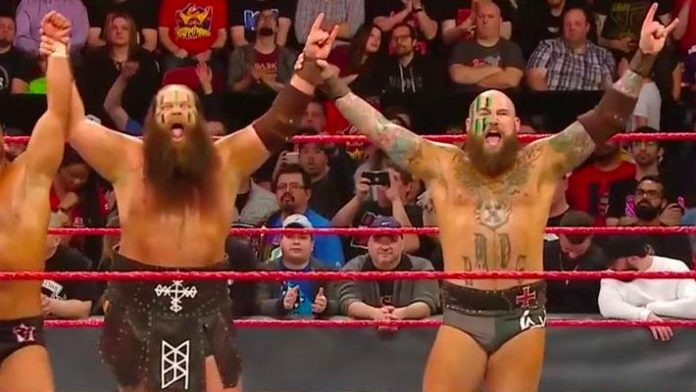 WWE NXT Tag Team Champions The War Raiders have undergone another name change. The War Raiders are now The Viking Experience. They duo also have new individual ring names, Ivar and Erik. The Viking Experience teamed up with The Revival (Scott Dawson & Dash Wilder) to take on Ricochet, Aleister Black, and RAW Tag Team Champions (Curt Hawkins & Zack Ryder) in an eight-man tag team match. At this time, it’s not really clear if they have joined the main roster full-time. WWE did not explicitly state that they are now Raw Superstars. As the reigning NXT tag team champions, it would seem this was just a one-off appearance. The Viking Experience captured the NXT tag team championships from Kyle O’Reily and Roderick Strong back at NXT TakeOver: Phoenix event during Royal Rumble weekend. WWE will hold the next set of NXT TV tapings on May 1st in Winter Park, Florida at Full Sail University. It will be interesting to see how Triple H handles this change to his tag team champions. What are your thoughts on The War Raiders’ name change?